Street Beat Brass Band: based in NYC, rooted in New Orleans tradition, and embracing brass based music of the street from around the world. As seen on ABC’s Good Morning America, NY1, and nationally-syndicated TV. Chosen by the US State Department, Street Beat has officially represented American culture on multiple international tours. An opening act for the New York Philharmonic, the band has been covered in the New York Times, NY Daily News, Queens Tribune and more. New York Foundation for the Arts Fellow Jeff Fairbanks leads this strolling band of handpicked veterans of Broadway, Frankie Valli, Count Basie, and Glenn Miller touring bands. 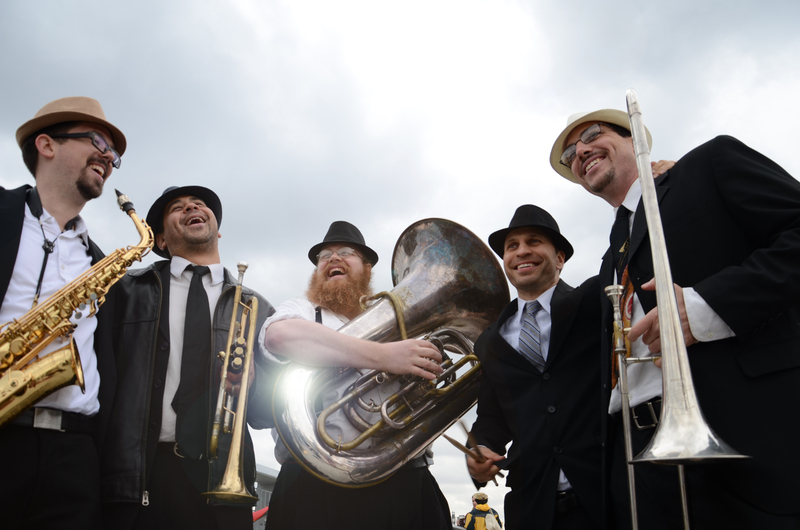 Influenced by the multiculturalism of NYC, Street Beat plays a wild diversity of brass-based music, from New Orleans Jazz to Polka, Mexican Banda, Gospel, Klezmer, and Funk. We add much more than a typical band to create the atmosphere you desire. For instance, we specialize in our mobility, as we are strolling brass and percussion musicians un-tethered to electric chords, amps, stages, etc. No one forgets seeing and hearing the high-energy spectacle of our roving musical party train! We also cater our style to every event to tailor to its exact musical needs. Street Beat appears as anywhere from a duo to our typical 5-piece setup. This allows us to cater to every event size. Consisting of trumpet, sax, trombone, sousaphone, and drums, we are completely acoustic and mobile enough to play any type of event, such as strolling, processionals, parades, leading a Nola second line, as well as parties, concerts, church services, traditional music venues, and more. Our repertoire includes familiar tunes from each tradition’s songbook, as well as originals, arranged in our unique, urban and energetic vibe. Each hand-picked member is also a conservatory-trained Jazz musician who can improvise creatively off the written tunes, adding their individual voice. When not performing with Street Beat, our members are variously playing in Broadway shows, teaching at the New York Jazz Academy, or performing and recording as freelancers throughout NYC. -“Fairbanks is a rising multi-faceted star if not musical voice on the New York scene”…”and his instrumental skills as trombonist are second to none” — Brent Black, at Critical Jazz. -National/international press coverage, including feature stories. -Independent Music Award winner, 2012. National awards from ASCAP, BMI, Aaron Copland Fund, NewMusicUSA, and more. -Veteran of the Glenn Miller Orchestra and Dorsey Orchestra, to name a few. Toured in Europe, Asia, Latin America, and throughout the U.S, in venues such as Carnegie Hall and Madison Square Garden. Street Beat is deeply rooted in the New Orleans tradition of street brass and drum bands. This energy and vibe informs everything we do, regardless of what style we happen to be playing. We bring this joyful, electric vibe to all our music. Our Jazz repertoire includes tunes from its very beginning, through the Swing era and beyond. In our opinion you can’t get a more funky instrumentation than with a band with horns. We get folks dancing with a mix of original and classic songs. Simply put, the acoustic warmth and vibrant power of Street Beat’s horns offers a soul-strengthening experience not found with our many electricity-assisted, guitar-strumming brethren. We revive the joyful, high-energy Gospel Shout Band tradition that has long inspired worship and brought congregations to their feet. Specializing in the infectious, brass-powered Banda music from the Sinaloa region of Mexico, we play this virtuosic music authentically. Refer to our press kit’s Mexican audio samples (“Juan Colorado” and “El Buque”). Our brass instrumentation makes Polka a natural fit. Horns harmonize the melodies; bass lines are carried by tuba — the way it should be! Hear our sample “Just Because” or watch “Beer Barrel Polka”. From its Eastern European and Middle Eastern roots, we incorporate modern NYC street life and grooves to the mix, to make a unique, contemporary, and infectious Street Beat style. All the while, we carefully learn the full structure of these frequently complex song forms, in our passion to perform the music authentically as well as to entertain.